Leawood Kansas in Johnson County, suburban Kansas City is a medium sized and sought after city in Kansas with a plethora of homes for sale. Let’s break down the Leawood Kansas real estate market by price range. Quick overview – the Leawood Kansas Real Estate Market as of 02/24/2010 294 Leawood KS homes for sale, 233 Leawood KS Homes sold in the last six months. This equals just over 7 months of inventory based on the last six months demand. Overall – Slight advantage to the Leawood KS home buyer. The difference occurs in the price range of the home you are buying or selling. As of February 24th, 2010 there are 44 homes listed for sale in Leawood Kansas, suburban Kansas City in Johnson County listed at $225,000 to $300,000. Since August 24th, 2009 42 homes have sold in Leawood Kansas between $225,000 and $300,000. Based on the rate of absorbtion of inventory with recent demand levels for housing in Leawood, a neutral real estate market for Leawood at this price point. As of February 24th, 2010 there are 79 Leawood KS homes listed for sale in suburban Kansas City in Johnson County with an asking price of $300,000 to $450,000. Since August 24th, 2009 77 Leawood KS homes have sold between $300,000 and $450,000. A neutral real estate market for Leawood at this price point. As of February 24th, 2010 there are 64 Leawood KS homes listed for sale in Metro Kansas City in suburban Johnson County listed at $450,000 to $700,000. Since August 24th, 2009 55 Leawood KS homes have sold between $450,000 and $700,000. Buyer advantage at this price point. As of February 24th, 2010 there are 40 Luxury Leawood KS homes listed for sale in suburban Kansas City in Johnson County with an asking price of $1,000,000 or more. Since August 24th, 2009, 2009 12 Leawood KS homes have sold at the Million Dollars plus luxury home price point. Even in Leawood a year and a half plus supply of homes compared to demand is a definate buyer’s market. Luxury home buyers may also be considering a unique home in Mission Hills KS located in Northern Johnson County. As of February 24th, 2010 there are 25 Leawood KS homes listed for sale in suburban Kansas City in Johnson County with an asking price of $225,000 or less. Since August 24th, 2009 36 single family homes have sold in Leawood, KS at $225,000 or less. There is a Seller advantaged price point in the Leawood KS housing market in the under $225,000 price range in the Leawood Kansas Real Estate Market. Smart buyers are seeking out the great housing options in Leawood Kansas. 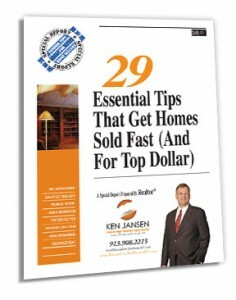 Call TODAY for a copy of my Special Report for Johnson County KS home owners ready to sell. Dial now Toll Free 1-866-251-4442 ext 7003 to order your copy – FREE! No one to talk to, just a recording. As of January 25th, 2010 there are 5 homes (non-villas) listed for sale in Camden Woods Subdivision located in Leawood KS 66224. The listing or asking prices range from $469,900 to $514,900. The home currently for sale are either two story plans or 1.5 Story floorplans. Homes currently for sale in Camden woods have 4-5 bedrooms and 4 and a half baths. How fast are Camden Woods homes selling and how much are Camden Woods homes selling for? Since January 25th, 2009 4 Leawood homes in Camden Woods have sold and closed. During that time the Camden Woods homes in Leawood KS 66224 have sold in the range of $390,000 to $475,000. Ready to buy or sell a home in Camden Woods KS 66224? In General, interest rates are at or near generational lows, assuming you have good credit. Now is a great time to buy, especially if you qualify for the $6500 Tax Credit. and you can get your low low low interest rate locked in. Ken Jansen is a Broker Associate with Keller Williams Realty Partners, Inc. Each Keller Williams Realty Office is independently owned and operated. Keller Williams Realty Partners Inc.